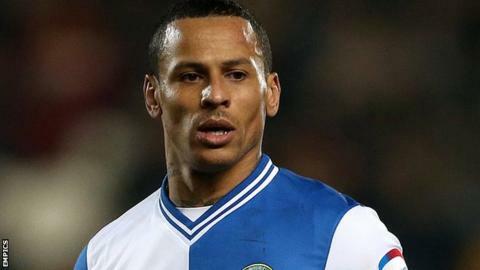 Striker DJ Campbell will not feature for Blackburn Rovers against Millwall on Saturday and has been granted time off by the Championship club. The 32-year-old was one of by the National Crime Agency as part of a spot-fixing investigation and has been bailed until April 2014. Campbell, who in July, has made five appearances for Rovers this term. The last of them came as a substitute in the on 7 December. Reporters attending a media conference at Blackburn on Thursday were handed a prepared statement by the club, confirming that Campbell had been given time away from Ewood Park. It read: "Blackburn Rovers manager Gary Bowyer is today unable to comment on or answer any questions relating to striker DJ Campbell for legal reasons. "As police investigations are ongoing, you will be aware that reporting restrictions are in place. If members of the media persist with trying to ask questions surrounding this sensitive issue then today's press conference will have to be suspended. "In light of this week's events, Rovers can confirm that DJ Campbell has been given time off to spend with his family and therefore will not be involved in Saturday's Championship fixture with Millwall at Ewood Park. The club will be making no further comment." Bowyer told BBC Radio Lancashire that he has tried to shield his squad from the ongoing investigation and concentrate on the club's next Championship fixture. "It's been business as usual for us," he said. "We've focused on what we can control and that's training. The players have trained magnificently well this week. Our focus is on Millwall."